We offer a comprehensive range of Protocol Converters . These convert numerous protocols simultaneously and are extremely quick. The Data Station Plus acts as a connector for industrial data collection and management. Now features such as data logging, protocol conversion and remote machine monitoring and control can be added to any equipment. 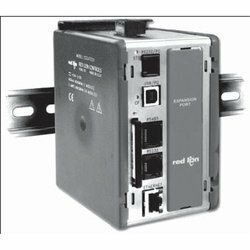 With three built-in serial ports and an Ethernet port, the unit performs protocol conversion, allowing disparate devices to communicate seamlessly with one another.